This week actually went by fast! I am so tired all the time all I think about is the weekend and when I can sleep in! It doesn't help that last night my little lovie woke up three times. I should tell who my little lovie is. 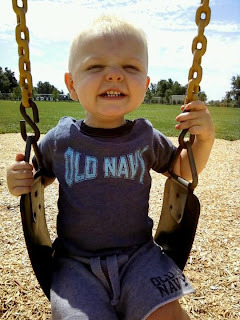 He is my BF's son and one of the love's of my life! He is the sweetest little boy and so adorable, he really makes your day better. My family loves him so much too. I joke that they actually replaced me with him! Right now he is going through the terrible two's. He turned two in December and let me tell you they are just setting in. Don't get me wrong he is still a happy, silly, loving boy. He just has this little man attitude now. He tells you no, or throws things if he doesn't get his way, he screams when you put him to sleep (he used to be the best sleeper ever), he is even a snack snob now and only wants certain things. I hope that when the baby comes he is out of this stage! I know he will love the baby but when he throws things he doesn't have the best aim and I don't which to be the catcher at at times. He loved Gavin so much but didn't understand that he had to be gentle yet. So he would try to throw the ball to him and play catch. I would give anything to go back to those days. Those were my happiest days everyone just said how much I was glowing and smiling all the time. I loved my routine with my two loves. My BF would come in and kiss my and Gavin then go off to work, I would feed Gavin and put him in his bassinet after I rocked him back to sleep. I would lay down and just watch him sleep. When Aiden woke up I would go get him out of his room and he would run to the side of the bassinet. He would smile so big and say BABY and try to kiss him. The three of us spent our days snuggled up. Aiden was feeling some jealousy naturally so I would hold them both while they napped. After Gavin died Aiden would still run in the room and look for him. He was too young to talk but he was visibly upset like where did he go? I wonder when he gets older will he remember his brother? Or will he be so confused when we bring this baby home? Time to work...everyone have a good Friday! 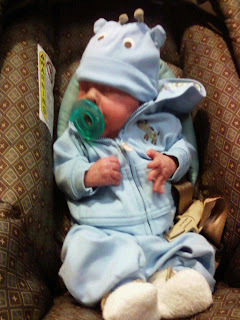 Below is Aiden on the swing and Gavin the day I got to take him home.